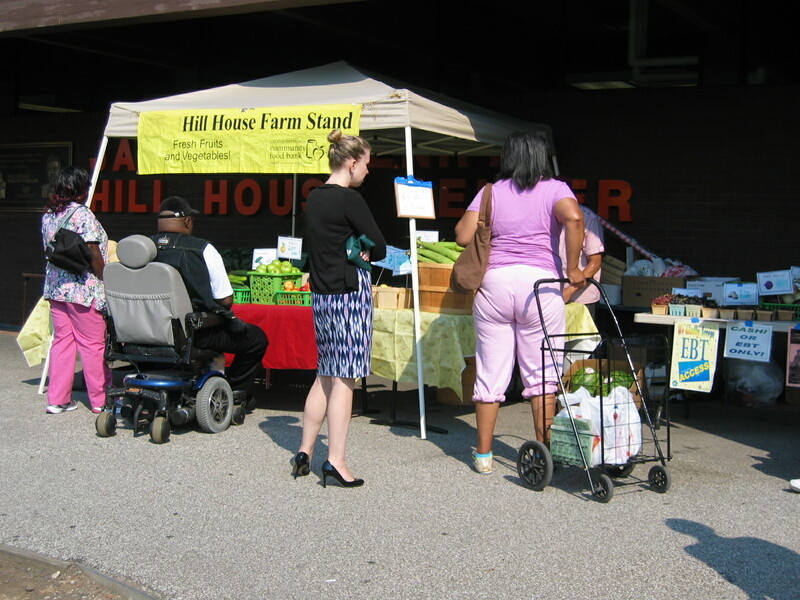 Since 2010, we have been partnering with the Greater Pittsburgh Community Food Bank as part of their Farm Stand Project to help bring fresh, local produce to under-served neighborhoods. Once a month, an Eat’n Park representative visits one of 13 different farm stands to promote local produce and ways to use it in everyday cooking. Food demonstrations and interactive learning are also part of the visit. The Farm Stand project is part of our LifeSmiles™ initiative, which empowers our young guests and their parents to make healthier choices. Farm stands are great places to get fresh, healthy food. 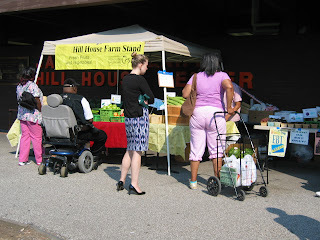 Check out some of the pictures, and we hope to see you at a Farm Stand soon! For a full list of farm stands, click here. Fall is in the air and at Eat’n Park, we’ve got something for everyone with our new made-from-scratch fall specials. We’re talking new additions to our breakfast, lunch, dinner and dessert menu! Plus, we’ve added new items to our $7 daily deals. Check them out here. But back to our fall specials…get ready to fall in love with Eat’n Park all over again! Santa Fe Turkey Sandwich – It’s back! Yep! You read that right – we now have sweet potato waffle fries! Enjoy a basketful, served with zesty apple butter dip. $4.99 P.S. You can also substitute them as a side for a small upcharge! MMM…comfort food at its finest! Our famous shredded pot roast topped with three types of cheese and served on our fresh-baked sourdough bread with Dijon horseradish. Served with your choice of one side for just $7.99. Or get it as our daily deal on Saturday for just $7! This new sandwich features roasted turkey, sautéed onions, peppers and mushrooms. Then it’s covered with Swiss cheese and topped with Dijon mayo. Available everyday and served on a hoagie bun and a side for just $7.99. It’s also our daily deal for Thursday for just $7! This recipe was created by Eric Snyder, a team member from our Natrona Heights restaurant. Thanks, Eric! It wouldn’t be fall without pumpkin, so stop in today for a slice of our new Pumpkin Crème Pie. It’s on sale for just $6.99! Or if you prefer to drink your pumpkin, try a pumpkin milkshake, pumpkin chai tea, or pumpkin latte. Our summer promotion, 7 Days, 7 Deals, 7 Dollars, was so successful that we’ve brought it back for fall ...and it’s better than ever! Each day of the week from 11 AM – 11PM, enjoy a sandwich, side and housemade pickle for just $7! And if these deals don’t tempt yourtaste buds, we also have heaps of new fall specials – check them out! We love a crispy, grilled to perfection grilled cheese, which is why this new Sunday deal is sure to put a smile on your face. We use not one, but three different cheeses (American, Swiss & Pepper Jack), plus three strips of our crispy bacon all nestled between two slices of our fresh-baked six grain bread. And don’t forget - Sunday is Potato Soup day, so get a cup as your side! Simple is good. We use roasted Butterball turkey, Swiss cheese, bacon, and tomato all served up on our grilled sourdough bread. Delicious! Everyone loves a classic turkey club and our version won’t disappoint. We’re talking roasted Butterball turkey, American cheese, bacon, lettuce, tomato and mayo all piled high on your choice of bread. Perfect with our fresh chips! Some things are just better on wraps, like our buffalo chicken! Chicken fillets tossed in our own special buffalo sauce, all stuffed in a warm tortilla with cheddar cheese, lettuce, tomato, and your choice of blue cheese or ranch dressing. YUM! Plus, it’s Potato Soup day again! One our newest additions to our daily deals, this sandwich will blow your socks off. First we sauté onions, peppers, and mushrooms. Then we add in roasted Butterball turkey breast and cover it with melted Swiss cheese. We add a touch of Dijon mayo and put it all on a hoagie roll. Can’t make it in on Thursday? Never fear. This new sandwich is available with a side everyday for $7.99. Our homemade tuna salad made with StarKist tuna, fresh green peppers, celery, onion, diced egg, relish, and mayo on grilled homemade Italian bread with melted cheddar, lettuce and tomato. Step into fall with our new pot roast melt! Our famous shredded pot roast is topped with Pepper Jack, Swiss and American cheese and served on our grilled sourdough bread with Dijon horseradish sauce. It’s comfort food at it’s finest! Even if you can’t visit on Saturday, you can still enjoy the Pot Roast Melt. It’s $7.99 with a side every day but Saturday. Don’t forget that you can only get these deals for $7 on the days they are featured! Back to school, back to busy! Don't have time to cook tonight? Stop by Eat'n Park and pick up dinner to go for the whole family. It's fast, easy, and delicious, and best of all, you'll get 20% off with this coupon! At Eat’n Park, we’re passionate about buying local. In fact, throughout the summer, we’re proud to feature many locally grown, seasonal fruits and veggies – not only on our Soup & Salad Bar, but also in many of our menu items. This year, we’ve expanded our passion for local food by being the presenting sponsor of Pennsylvania Association for Sustainable Agriculture’s (PASA) Local Food Month in September. This year marks the tenth anniversary of our FarmSource™ program, where we support and buy local produce. Last year alone, we spent more than $10 million dollars in local sourcing and worked with more than 200 local growers, farmers, and dairies. Our sponsorship of Local Food Month just made sense! We’ve been a strong supporter of PASA since 2005 and really believe in their mission in supporting our local farmers. Throughout the month, various events will take place to shed light on the importance of buying local. For a full list of events, visit www.localfoodmonth.tumblr.com. Every month here on our blog, we'll be highlighting one of our non-profit partnerships. This month, learn a little more about the Ryan Clark Cure League. Pittsburgh Steeler Ryan Clark recently teamed up with the University of Pittsburgh and UPMC to raise awareness about sickle cell disease and funds for research. Sickle cell disease affects millions of people worldwide, and is the most common inherited blood disorder in the United States. It primarily affects African Americans and people of Mediterranean and Middle Eastern descent. Through the newly formed Ryan Clark Cure League, Ryan hopes to create a better future for those living with the disease. Ryan has the sickle cell trait, meaning that he carries the gene for sickle cell disease. People with sickle cell disease inherit one gene from each parent for the abnormal, sickle-shaped hemoglobin. These cells become lodged in blood vessels, causing excruciating pain, infections, and potentially damaging vital organs such as the lungs and heart to the point of organ failure. Organ damage and even strokes can also occur in children and adults who have the disease. There is no cure for sickle cell disease and few successful treatments. People who have this disease live with chronic pain and frequent hospitalizations, and many die in their 40s or 50s. Ryan’s sickle cell trait became a national story during the 2007 season when he first realized that he carries the trait in a game against the Broncos in Denver. Even though he does not have the disease, the high altitude conditions, such as that of Mile High Stadium, caused Ryan’s red blood cells to sickle. He became very sick and needed emergency surgeries to remove his spleen and gallbladder. Ryan’s subsequent inability to participate in away games at Denver—including the first game of the Steelers regular season on September 9th—continues to make local and national headlines. Ryan is passionate about creating a better future for those living with sickle cell disease: He is partnering with experts at the University of Pittsburgh Vascular Medicine Institute and UPMC to build the world’s leading research program for patients with sickle cell disease, with a focus on finding better treatments that will improve patient care until a cure is found. But Ryan can’t tackle this by himself—he needs help to expand this message of awareness and hope. Visit www.cureleague.org or call Kim Olsen at 412-647-4276 to learn more about how you can support the Ryan Clark Cure League. Bright lights. Pep rallies. School mascots. Yep, you guessed it, it’s high school football time! Our local schools and communities are important to us, which is why this year we are the proud sponsor of Channel 11 Skylights High School Football. 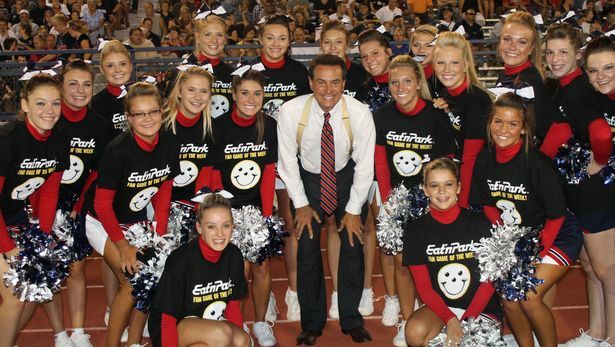 Channel 11 Skylights High School Football focuses on high school football and all that surrounds it. Visit www.wpxi.com to vote for the game of week, player of the week, spirit award, and band of the week. Plus, each band of the week will be challenged to memorize and perform our jingle! If they can complete the challenge within the week, we will donate $500 to their band program. Be sure to check our Facebook page to see if they won the challenge! And don’t forget to stop by your local Eat’n Park for a post-game meal. We’ve got something for everyone!